theAsianparent (TAP), the largest parenting portal in the region, has gathered 110 (and counting!) influencers across Southeast Asia to establish the ‘TAPfluencer network’, the first of its kind. Composed mostly of mumfluencers, a handful of dadfluencers, as well as thought leaders, the network has a collective reach of 6.1 million users across Asia: 2.4 million on Facebook and 2.5 million on Instagram, to name some platforms. Connecting the right influencers with brands they truly believe in, the network benefits its members, marketers, and theAsianparent audience alike, through engaging content coming from the TAPfluencers’ real mum/dad perspectives. As they test products and take part in campaigns and events, TAPfluencers will be able to gain unique brand experiences to share with those in the same parenthood stage – from expecting a baby all the way to raising a pre-teen. The list of TAPfluencers was debuted during the launch event last September 9, 2017 at the Tickled Media headquarters. Members of the TAPfluencer network were in attendance to take part in the momentous event. 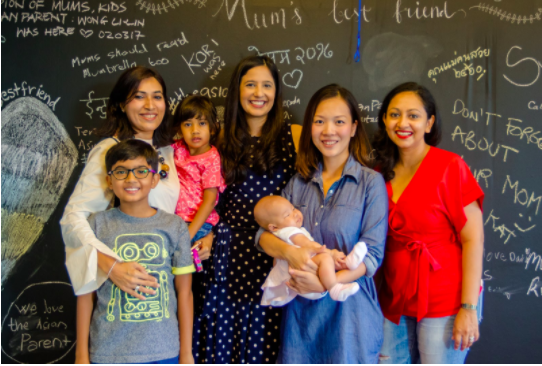 Mumfluencers Pooja and Ashlyn with their tots plus Tickled Media Founder and CEO, Roshni Mahtani, and Project Lead Minoli Almeida. A full-time working mum of two, she believes that “Tough times don’t last but tough people do.” Diagnosed with Non-Hodgkin’s Lymphoma when her eldest was 9 months old, she beat the disease and now helps others through the Singapore Cancer Society. A TV personality and mum of one with another on the way, Malaque is known to many as the wife of rapper, Syarif Sleeq. Together, they run their hit food business, Chulop! churros, which they call their ‘first baby’, borne of Malaque’s baking prowess and delectable homemade recipes. The young parents’ unwavering faith and strength during their heartbreaking struggle with late daughter Courageous Caitie’s rare medical condition, inspired many throughout the region. They are blessed with a new angel in their lives, and are stronger than ever as a family. She’s the woman behind ‘modern mommy lifestyle blog’, The Bag Investigator, which provides tech, beauty, and food updates and informative reviews on bags – from latest releases to spotting fakes. She also incorporates her parenting takeaways and motherhood milestones into the blog. The beauty-blogging mum of two has long been influential in the lifestyle circles of Malaysia. With her transition to motherhood, she shares tips on staying gorgeous, despite the demands of child-rearing. Every mum’s fitspiration, she is the brains behind Cikipedia, a blog that shares her secrets on staying young and fit, especially as a new mum to baby Luca. She is also a practicing Pharmacist (UK) and a Certified Fitness Nutritionist (NASM). A doctor, wife, and mum, she is the author of Heart Emergency Book and Save My Soul. Fondly known as ‘Doctor Duck’, she describes herself as a “Doctor for people”, sometimes even answering her followers’ health concerns over social media. Of the many roles she’s played on the big and small screens, perhaps the one she enjoys most is her current one as mother to the adorable Kenzie. She is married to dadpreneur Chandra Tauphan Ansar. Mummy Prae takes pride in balancing work and family life. She tackles common parenting problems and shares a ‘Mummy Guide’ featuring tips on childcare, alongside lifestyle stories and updates. Sharing her musings on motherhood, Mummy Air blogs her stories, photos, inspirations, and experiences as a young mother, covering topics ranging from pregnancy and breastfeeding to preschool, as well as home/parenting tips. To know more about and especially to join the TAPfluencer network, visit sg.theasianparent.com/tapfluencer-network. theAsianparent would like to thank our partners for the TAPfluencer launch event: Elsie’s Kitchen, L’Oreal, LOL Party Animals, Dreams and Doodles, Scotch-Brite, Curél, MegRhythm, Dashen, Comfort, Breeze, Vitagen, Hugi, and Vagisil.